I love the undulating color changes-here she is in all her glory. I have been able to test knit a few patterns now and I've said it before, but I'll say it again-it's so fun being in on it! I've either gotten very lucky, or most designers have their stuff locked down because I haven't really found huge errors on anything I've tested. Melanie Berg is a designer whose aesthetic I really appreciate. Clean lines and modern designs with just a touch of lace thrown in to make a piece feel feminine or dressy. Testing The Joker and The Thief was a joy, so I thought I'd post some photos that I took after weaving in the ends and giving it a light blocking. The minty green and soft seaglass were my two favorite colors in this piece. Taken on their own, they may have been too soft for my taste, but together with the sandy beach silk yarn and the darker tones of a carribean sea they were glorious. I loved the detail of the Indian Cross Stitch. Switching to sharper ChaioGoo Red Lace needles made that one a breeze. I've got another test that's just about off the needles that I'm really excited about and I'll share more when the pattern goes live this weekend. It involves some of my favorite yarns to work with and a fun colorwork scheme! Each time I'm knitting something, it never fails that one of the boys will ask me 'Is that for me?' The answer has always been no .There are loads of adorable patterns for kids, an entire ravelry group devoted to people who knit for their kids and even knit for their male children. I felt like a loser. All this time spent making knots with two sticks and never anything for my own chitlens. Through a random string of instagram likes (Hello, Big Sister Cardigan KAL), leading to pattern searches, led me to Kate Oates of Tot Toppers. I have seen her 'Gramps' cardigan everyeon, and it has been in my queue for ages, but this one, Boys Can Wear Pink, is T'Shirt style with raglan sleeve shaping, and knit in the round with nothing but a little underarm grafting in the way of seams; I knew I was on to something. A quick glance at the calendar showed Easter as being a few weeks away. I definitely had time to knock out three sweaters for them. I know myself well, I am quick to jump to the 'Meh, not enough time. I can do these for another event.' So I told the boys and let them pick from some color options and from there I had a lot of fun playing with making the colors work both for the pattern yardage needs and for their personalities. I made their current clothing size (10, 6 and 4-yes, Jack often wears 4's already...) and all three of them fit perfectly. The yardage requirements were correct and I made zero modifications-that in itself is pretty awesome. 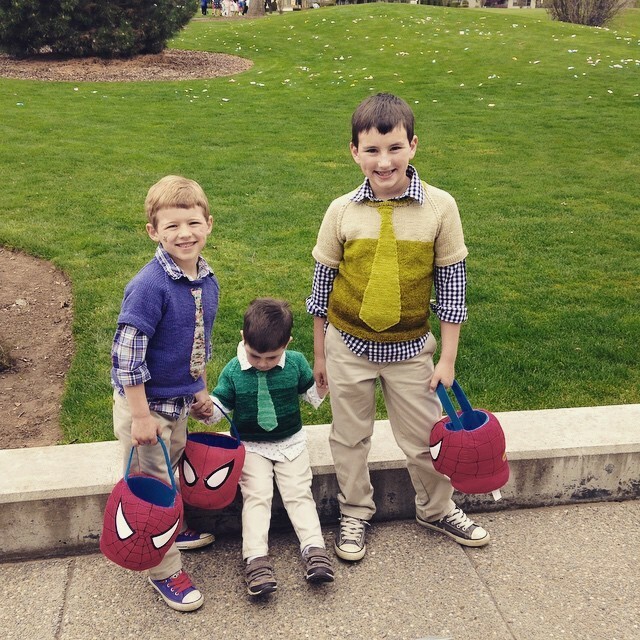 Henry and Jack are much more subdued, and their sweaters were as well. Utilizing two of my coveted YOTH ooak gradient sticks (with an added skein of Big Sister in Hazelnut for Henry's in order to meet the yardage requirements) for them was perfect. I love the finished hem and sleeves, which was also super simple but makes for a really clean-edged finished piece. 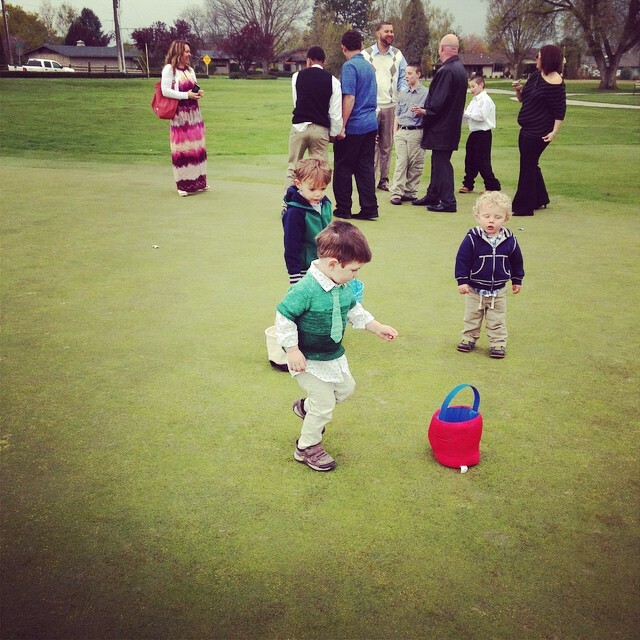 Paired with button-downs they already had in their closets, twill pants and Chuck Taylors, they were perfectly presentable for the country club brunch and egg hunt and now I have the itch to make lots more fun and funky pieces for my kids. Usually having an itch isn't an awesome thing, but in this case I'ma scratch it. why yes, that is a tattoo on his face...isn't that where all moms want their kids to put them? Because I'd been so fixated on finishing their sweaters, I realized yesterday that I hadn't put much thought into Stella's outfit. 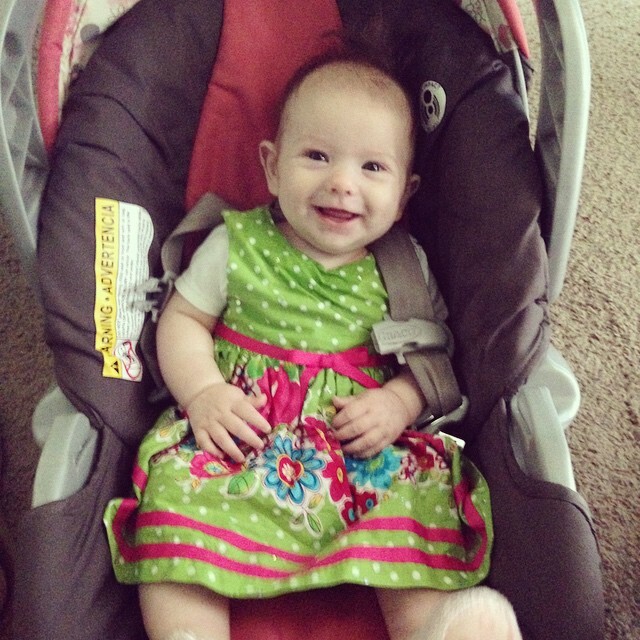 I went out to the six month bag and found there were several adorable spring dresses. Sadly, I didn't realize until today that I have zero pairs of tights for her cold legs. Girl mom fail. She didn't even have a bow in her hair. Ah well. Baby steps. Thanks to Kate for such a fun and simple pattern that leaves loads of possibility in customizing for personalities. Next up, I have some fun sweaters by Tin Can Knits up for Miss Stella and Mr. Jack for next Fall and Winter and even the remainders of this spring. Check out their new Max and Bodhi collection, the first release is adorable. These also count as sweaters 1-3/12 for Twelve Sweaters in 2015.